Obituary – Divine, Peggy Ann (Ewy) « Perry High School Alumni Association, Inc.
﻿Class Assemblies 48-51, Freshman Glee Club 48-49, Red Hot Treasurer 51-52, Red Hot Member 49-52, D. E. 51-52. ﻿Peggy Divine, 64, Pendleton, OR, formerly of Perry, died Tuesday, Sept. 7, 1999, at St. Mary Medical Center in Walla Walla, WA. Funeral will be at 2 p.m. Thursday, Sept. 9, at Burns Mortuary Chapel in Pendleton, OR. Burial will be at Skyview Memorial Park at Pendleton. Mrs. Divine was born Oct. 19, 1934, in Perry, the daughter of Paul and Dorothy Ann Chenoweth Ewy. 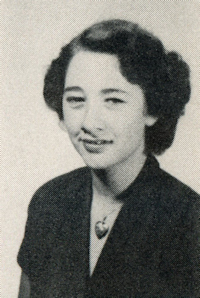 She graduated from Perry High School in 1952. She and Curtis Divine were married Sept. 3, 1952 in Huntsville, AR. She was owner and operator of Zigman’s Flowers with her husband, Curt, and daughter, Judy in Pendleton. Her family related that she liked bingo, loved flowers, family and kittens and her many employees through the years. Survivors include her husband Curt, of the home in Pendleton; her mother Dorothy Ewy, Perry; one son Tony and wife, Jana Divine, Pendleton; two daughters, Judy Divine, Pendleton; and Sandy and her husband, Bill Belk, Las Vegas, NV; one brother, Jimmy and wife Marilyn Ewy, Perry; one sister, Janet and husband Ronnie Mack, Lucien; five grandchildren; 12 nephews and three nieces. Memorial contributions may, be made to the Shriner’s Hospital for Crippled Children, 3101 S. W. Sam Jackson Park Road, Portland, OR 97201 or through Burns Mortuary of Pendleton, P. 0. Box 489, Pendleton, OR 97801.